....at least, that's what I think. Pretty sure M-Tron weren't miners, they were rescue workers. I grew up near the end of this (an Ice Planet set was probably my first Space set but I collected more Spyrius/Exploriens) but I wouldn't necessarily consider these the best—really good, sure, but I don't particularly prefer them to the newer stuff, in terms of story or sets. They were miners to me. And back then different countries had different marketing and blurbs for the same product. It was a great era, that is for certain. For me the 10 years following the Classic sets was the most interesting. I have all of the sets (minus a few polybags) from Futuron->UFO, with a lot of multiples. As a kid, I only had a handful, and all the catalogues to dream with. Good luck, I have given up on TLG giving us anything much that resonates with me. They apparently try, but the play-test kids prefer the other stuff, so that's what they sell. Space Police I had quite a nice colour scheme, I can't decided whether I like I or II more, although I missed out on Space Police I.
I like BlackTron II's colour scheme more than BlackTron I however. White/black/green was distinct, the old all-black theme less so. 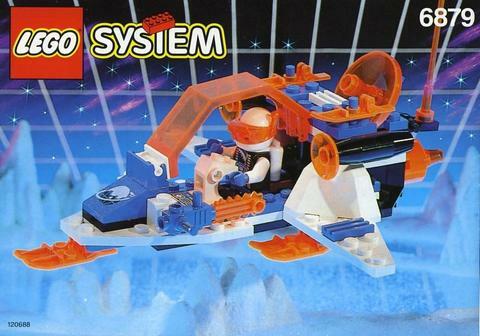 I think the thing which I like the most about this era in particular (my last sets at the time were Spyrius era stuff too Lychir), was that the spaceships were so stripped-down and simple. They had a feeling of being closer to current space technology, being in flimsy little vehicles, moon buggy-like, needing oxygen tanks, helmets, and apparently using rockets with probes on (like in that Ice Planet poster at the top of the thread). The ships, like Benny's Spaceship in the Lego Movie, just flew by unknown means, like some sort of efficient electric-thrusters maybe, and were often small personal craft that only carried a single minifig (adding to a sense of hard-sci-fi isolation). Later themes had too many organic pieces and didn't create this feeling, removing oxygen tanks, and having alien invaders with organic leg/tentacle pieces everywhere. Looking back, I think maybe Life on Mars was a mistake, because it confined Lego Space to one planet, and the sets were less utilitarian. Then things like Alien Conquest and Galaxy Squad don't interest me in the slightest, with generic alien bugs and a conflict-only theme. I think therefore that the factions got steadily less interesting bit-by-bit after Ice Planet in 1994, and the physical design of sets got less interesting after Exploriens in 1996, being progressively less industrial, but the theme remained good like you say Artanis for a few more years. It's worth noting that BlackTron/Space Police persisted for over half a decade, whereas these later factions lasted about a year, so you can perhaps see decline. As Wikipedia notes, factions were broken down into Heroes, Civilians and Villains until around 2000. 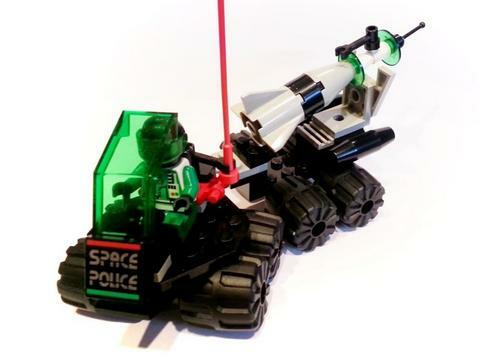 I think for me, the earlier space theme was more scientifically-accurate looking and hard-sci-fi, but got progressively less, with Space Police III having a space police station that looks like a present-day building, and the Alien stuff from just before the end of the space theme became really detached from engineering ideas. I would want to see a return of that 80s/90s engineering attitude. Somewhat retro-sci-fi with NASA-like technology. This kind of design from just before the space line was discontinued was, in my opinion, boring and generic. Gone are the rocket nozzles, magnetic cranes for lifting mining material, the moon buggy look, and it's just some generic Earth-confined UFO theme, with a generic space soldier. It then got even less interesting in Galaxy Squad. Essentially it took away the point of the original space theme, which was one of Lego's original big themes; being a grounded industrial setting full of possibility. It no longer has anything to distinguish it from a setting like Star Wars, where the villains are actually interesting. I disagree in that I liked Galaxy Squad--despite not being a fan of lime green (at the time), I liked the color scheme of the bug dudes, the audacious colors reminded me of Ice Planet. The good guy stuff was more drab, but I appreciated them as white parts packs. 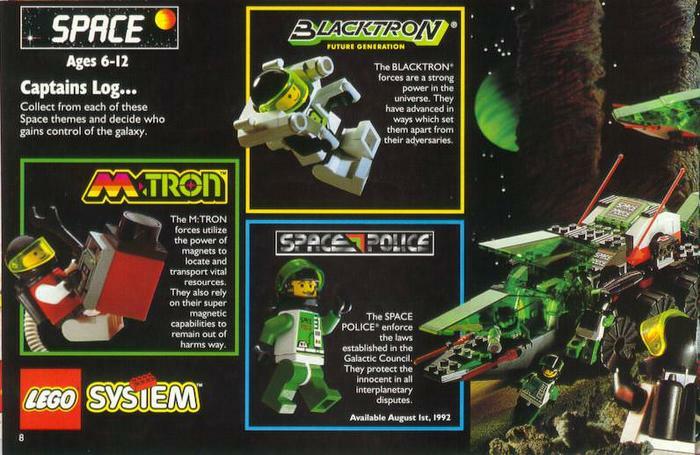 Agreed on the other stuff, though; Space Police II (dark trans green ftw!) 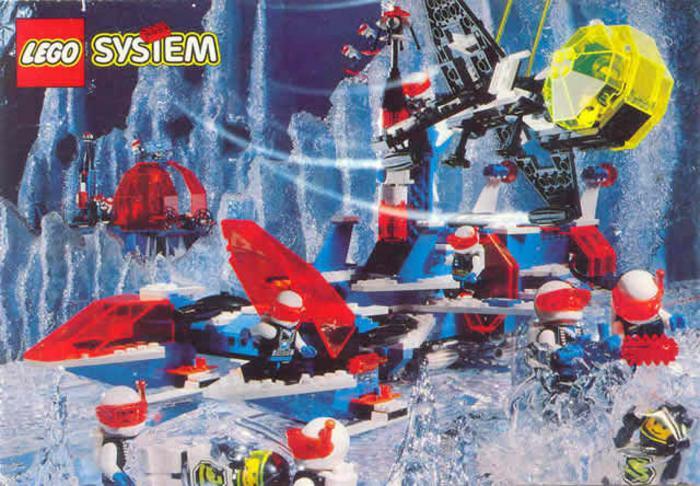 and Blacktron II, combined with Ice Planet on the shelves was probably the best time we had. I don't think an update on those themes would appeal to me much, though, because I believe there is a little too much nostalgia there. The last wave of Nexo (the infection wave) had a lot of SPII and BTII aesthetic, but I bought none of it, despite thinking it was okay. That's the problem though--it was merely okay. While this is true, I've never seen any M:Tron blurbs or marketing that back up the "miners" interpretation. If you are aware of any that you could show me then I'd certainly love to see them though because I am always fascinated with how themes back then were marketed differently from region to region, and story/background info on themes from back before the internet is sometimes hard to come by! I think it's a little unfair to argue that the Space theme used to be more grounded back in the day. Even in the Classic Space era it fluctuated quite a bit, with some sets depicting fairly realistic unmanned rocket launches and others depicting giant robots. Heck, M:Tron had a space helicopter with laser rotors, something that's practically hitting Nexo Knights levels of silliness. I also don't understand the argument that recent Space themes have been less distinguishable from Star Wars. After all, Star Wars has way more boxy, industrial-looking spaceships than it has 1950s-looking flying saucers or spaceships shaped like giant bugs. And it's hard to imagine that the designers of Allied Avenger and Super Nova II weren't in any way inspired by Star Wars' X-Wing Fighter. And "fewer unique pieces specific to one set"? I might need a citation on that. The sets were simpler back then, sure, but even today there are very few sets that use genuinely unique parts for things besides character and creature parts and accessories. Parts like 2336, 2409, 2426, 2464, and 2680 were just as set-specific as typical non-figure parts from Alien Conquest or Galaxy Squad. The idea that sets today are full of specialized parts that are only designed to build one thing is an ignorant cliche, not a reality. I used to be like many here and wished TLG would revisit the classic space themes. As time went on, however, I've realized that really wasn't what I want. All I really want is for TLG to release a classic space printed elements pack. Just some bricks, tiles, slopes, and minifigure parts in the appropriate colors printed with the Classic Space, Blacktron (I & II), M-Tron, Ice Planet, Spyrius, Space Police (I, II, & III), and Exploriens logos. That's all I really want. If they release a separate pack with trans yellow/blue/green/red/neon green/neon orange windows and canopies (and ice equipment), that would be a bonus. I've accepted that TLG will likely not revisit these old themes because of business constraints, but I think a small elements pack is doable, especially if it is DTC (direct to consumer), available only through official LEGO stores or their shop website. See, I'm not interested in following instrucations and building new space sets. I just want the printed elements so I can MOC in the old themes that appeal to me. And this doesn't just have to apply to classic space themes. I'm sure there are castle builders who would love to see the Black Falcons reemerge in their MOCs. Actually, from what I remember at the time, it had to do with Magnetics. 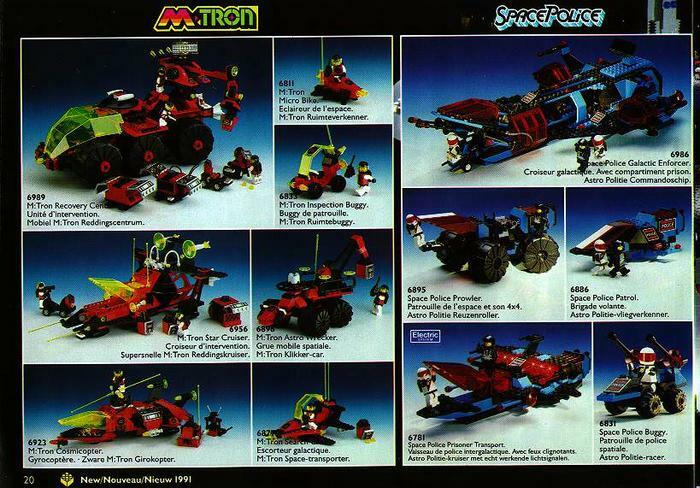 They were the first space set to introduce magnetic pieces, which are present on almost all of the M-Tron sets. As far as more recent Space themes breaking off into different tangents; I actually have no problem with this as long as TLG is at least continuing the theme, somehow. I think these can result in some pretty cool ideas; for example, Alien Conquest sets can be comboed with City pretty easily, and Space Police 3 seems to have at least some sets that are not actually taking place in the vacuum of space (Officers with open helmets, no airtanks, etc), which seemed to be intended more for a gritty, planet-based, Blade Runner-type motif. One thing I did love about the old days was the simultaneous production of multiple factions, though and I would really like to seem more civilian applications, based on exploration, science, and engineering. The catalog image above says M:Tron uses "the power of magnets to locate and transport vital resources." Not specifically mining but could encompass or complement mining. However, no drills. A mining faction with no drills is pretty much nonsensical. - Middle history 3: "Spyrius", a very aggressive faction with advanced robotics, arises to menace the spreading pressure-suit clad civilization, so all other factions merge to form "Unitron"
You could probably fit other eras of Lego space into the timeline, or rearrange this timeline so that, say, Space Police II comes before Space Police I (some of the Space Police I stuff looks almost like an evolution), but I like the idea that all these eras are closely linked, as their equipment is very very similar. Some of the later stuff has all sorts of advanced technology, like UFOs, yet is meant to be set earlier on Earth, so I prefer not to include them. Space Police III does not make much sense in this respect either, since they operate out of precincts that look like Earth buildings, and arrest half a dozen alien species, which there are no sign of in earlier Lego Space. I prefer to place them in another setting, although they could of course be reasoned away as some urbanised planet, I just don't feel like it fits the spartan theme of other Lego Space. I love how they are all on low gravity rocks and photographed with ice! See, I would take that space bug set any day over the SPI set. It's one I actually have been on the lookout for a good deal on, but haven't managed to pick up yet. I find the SPI set too boxy and basic, like it's nothing really more than a bunch of stacked plates. 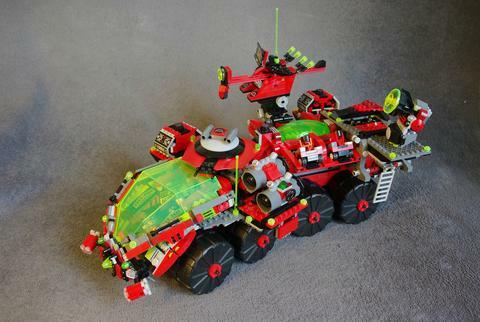 The bug is full of curves and shapes and pieces that I would love to try and reuse in a MOC. However, if you don't like the organic look of it, that's totally your thing. Clearly we have a difference in taste and I can respect that. This. I didn't realize this was what I really wanted until you said it, Pombe. It would be enough to satiate my nostalgia while building my own thing. But it would also have to include those big angular quarter-dome pieces, in all the classic trans colors (red, neon green, dark green, and neon orange) as well as black and white. That kind of thing would be an instant buy for me. While that sounds fantastic to me, we need to step back and compare Nexo Knights, Chima, Galaxy Squad, Monster Hunters, Ultra Agents, Alien Conquest, and Space Police III to Ninjago and ask, "what made Ninjago so much more popular than all the others?". Ninjago obviously has some sort of secret sauce that the others didn't. Nexo Knights and Chima also had cartoons, but for some reason didn't really resonate with children. So what is Ninjago's secret sauce? And how can we apply it to a new space theme? Without this we really don't have an argument to convince TLG to listen to us. While Ninjago has a lot of strengths, to be honest I think sometimes which themes become huge successes and which don't can have a lot to do with how well tailored they are to kids at the particular time that they come out. It could be that specific aspects of Ninjago's storytelling and design elevate it over more short-lived themes, but we mustn't dismiss the possibility that kids today might just be more interested in ninja than in knights or aliens or spies or animal warriors — and that even Ninjago might not have had the same success if it had launched ten years earlier or later. 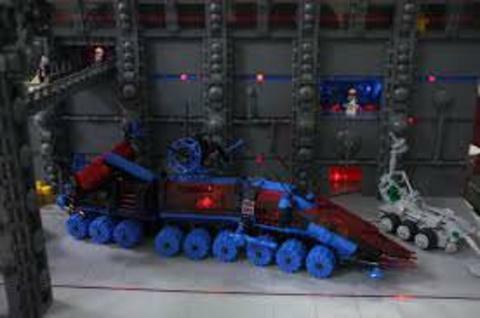 I also think that some of Ninjago's strengths would not be able to translate well to the kind of space theme that AFOLs are nostalgic for. Like, Ninjago has a story rich in magic and legends that could certainly have a place in sci-fi, but would result in something a lot more "Star Wars-ish" than traditional space themes. It is also intensely character-driven, which I know is something many old-school AFOLs are averse to. It contains an eccentric mix of ancient and futuristic design cues, sometimes even within the same set, and it embraces "gimmick" sets like spinners and fliers. Finally, I think on some levels LEGO might not even be interested in giving other themes some "secret sauce" that made Ninjago such a mega-hit. If other themes have the same strengths as Ninjago, then they risk competing for the same audience, which may very well be part of what held Chima back. Remember, when the idea of Chima was conceived, Ninjago was not expected to last longer than three years — instead, though, Chima wound up having to share shelf space with Ninjago for its entire lifespan. It was probably not accidental that the Nexo Knights app game, the connective tissue that tied together its sets and media, was unlike anything that had been done for Ninjago. Even if there's no guarantee of achieving Ninjago-like success, it can still be more worthwhile for LEGO to keep trying new things hoping to discover a new "secret sauce" than to try and make a second Ninjago. Everything you wrote makes complete sense. Though I will disagree with the idea that LEGO might not want a mega-hit, because I think each theme is an educated gamble by TLG looking for the next Ninjago. Instead of letting this become just another wish list thread, I was hoping to steer this discussion towards "how can LEGO Space be brought back as a theme in the business sense?". To do this, we need to look at the data that exists. We know that Ninjago is/was wildly popular. We know that Chima wasn't. We had two similar themes that went head to head with each other, and Chima lost. Why? If you asked me which theme I would prefer: a) ninjas searching for golden weapons who fight via spinning at each other or b) knights who ride on horse mechs and live in a castle on tank treads, I would have voted for the knights, hands down. And I would have lost. My wallet cannot compete against the wallets of the parents of countless children. Ninjago, which started in 2011, went 4-0 against other action themes, if you throw in Monster Fighters and Ultra Agents. That is crazy good. I love Classic Space and all the subthemes. And this post is me trying to figure out in my head how to make it just as popular, if not more so, than Ninjago. I want to create a logical argument (not based on nostalgia or what AFOLs wish for), based on what we know about existing LEGO themes, that is compelling enough business-wise (it will sell like hotcakes and make a lot of monies because parents of children cannot hand over their wallets to TLG fast enough) to bring Classic Space back as a theme. 4 hours ago, pombe said: I want to create a logical argument (not based on nostalgia or what AFOLs wish for), based on what we know about existing LEGO themes, that is compelling enough business-wise (it will sell like hotcakes and make a lot of monies because parents of children cannot hand over their wallets to TLG fast enough) to bring Classic Space back as a theme. I think you're right that the biggest problem with revisiting the old space themes is fan service to AFOL collectors when it should be engagement with the kids whose parents buy all the sets. I loved the open ended multi-faction framework of 90's space but kids want named characters, a TV show and a defined story that's boiled down to good vs bad so they don't get confused about who to root for. Maybe I'm being condescending that's mostly how Star Wars works too. If I'm honest, while ever Lego Star Wars keeps selling, I think there's no room for an independent 'hard sci-fi' theme because the kids will want Star Wars and there's more than enough of it to fill their little sci-fi boots and empty their parent's wallets. And those that don't want Star Wars get Ninjago and City... they don't just want different spaceships. Maybe I'm wrong... Who knows? Previous popularity isn't everything, or shouldn't always be everything, in business terms. Sometimes it pays to build a new setting's popularity, or build interest slowly in an idea. Maybe a company should not always think one success is innately transferable to a completely different type of setting. Also do people want all Lego themes to just be a Ninjago clone? Sometimes themes or franchises do well by accident, maybe accidentally capturing the mood of the time, or accidentally finding talented writers, or accidentally touching on deeper ideas. I don't know a lot about Lego's current themes, but there is no secret sauce sometimes. Fantasy can always be potentially interesting, and good vs. evil touches on something deep in us. I don't know much about Ninjago or Nexo Knights. My interest in themes ended around Spyrius and Aquazone. You make it sound like Ninjago is really popular compared to past successful Lego themes, such as Bionicle and stuff, which I didn't know, although I had noticed it has been around a while, and has it's own show. To me, Ninjago's setting looks superficially similar to Naruto, Samurai Jack or Avatar: The Last Airbender; a medieval Asian-inspired setting with anachronistic future technology mixed in (allowing for a wide range of possibility), and Nexo Knights, which seems to have been an attempt to do the same with medieval European-inspired fantasy, does not look inherently less interesting as a concept, if it didn't do as well, I would guess that it was just down to the luck of what world-building and writers they ended up with. Maybe they touched on the spirit of the times. Maybe they managed to incorporate some deep themes in a way that people didn't notice. Maybe the design of the sets were really good. The thing that is most attractive about Space Opera is that it allows for a wide range of possible adventure and travel. Later Lego themes narrowed the scope of the potential adventure more and more, until it was Earth or Mars focused, instead of some undefined future on un-named planets. There were many science fiction television shows that were better than the rest of TV at the time, but they were overlooked because general audiences were prejudiced against sci-fi. Fantasy largely escaped from this prejudice in the last few years, due to the success of a couple of franchises, but science fiction is still sometimes unfairly treated as a niche interest to be avoided by general audiences, despite it actually being physically possible to go to other planets one day, where fantasy will always just be mythical. General audiences tend to be sometimes scientifically illiterate, as seen by how many people can't distinguish between science fiction and fantasy, when one is (in general) physically possible, and the other is (in general) purely mythic. Perhaps one day there will be a science fiction property so popular, that trend-followers feel they finally have societal permission to enjoy something that more open-minded people already knew was good, just like happened with fantasy. I would suggest Lego Space would never be as popular as Ninjago due to the mood of the times, which is currently very fantasy-heavy, or superhero-heavy, but that this doesn't mean there is no market, or that the theme can't thrive as a low key one. Maybe release 20 sets across 4 factions, and keep them in production for 5-10 years just for people interested in this stuff. Perhaps focus on industrial stuff like giant space diggers, space trains, space police ships; after all, Lego Space was in some ways Lego City plus 3000 years. Introducing a restricted humans vs aliens theme was arguably what hollowed out those later 2010s themes, with their generic space men shooting generic bugs. Building a lived-in setting is what I would rather see, and that has always been what attracted people to space settings. It might even help distinguish the product from Ninjago, if the TV show was actually more adult and sober, like a classic space opera show, such as Babylon 5 or Star Trek. It might even find accidental success. I loved the open ended multi-faction framework of 90's space but kids want named characters, a TV show and a defined story that's boiled down to good vs bad so they don't get confused about who to root for. I think you are correct, but what I'm trying to figure out is why themes that had this exact same formula, such as Chima and Nexo Knights, lost to Ninjago. What does Ninjago have that the others didn't? Essentially, I'm trying to identify/quantify what Ninjago's je ne sais quoi is and learn from it. I want to agree with you so badly it hurts. it intuitively makes so much sense. But business decisions at large companies are usually predicated on either previous success or the success of others. Most LEGO themes are updates of past themes (Ninjago = Ninja + Exo Force). Bionicle was introduced to compete with action figures. Brickheads were introduced to compete with collectible figures. New and radical ideas usually fall into the realm of startups or companies with true visionary leaders with tremendous clout (such as Steve Jobs or Elon Musk). LEGO Friends only got introduced because it was a long term goal of TLG to break into the girls toy market and only happened after failed attempts (Paradisa) and over five years of market research. Surprise breakout success does happen. And I think it's important to understand why and and if we can apply those lessons to LEGO Space, because it's my favorite theme. ...if it didn't do as well, I would guess that it was just down to the luck of what world-building and writers they ended up with. Maybe they touched on the spirit of the times. Maybe they managed to incorporate some deep themes in a way that people didn't notice. Maybe the design of the sets were really good. This. This is what I'm trying to figure out. There were many science fiction television shows that were better than the rest of TV at the time, but they were overlooked because general audiences were prejudiced against sci-fi. Fantasy largely escaped from this prejudice in the last few years, due to the success of a couple of franchises, but science fiction is still sometimes unfairly treated as a niche interest to be avoided by general audiences, despite it actually being physically possible to go to other planets one day, where fantasy will always just be mythical. General audiences tend to be sometimes scientifically illiterate, as seen by how many people can't distinguish between science fiction and fantasy, when one is (in general) physically possible, and the other is (in general) purely mythic. Perhaps one day there will be a science fiction property so popular, that trend-followers feel they finally have societal permission to enjoy something that more open-minded people already knew was good, just like happened with fantasy. I would suggest Lego Space would never be as popular as Ninjago due to the mood of the times, which is currently very fantasy-heavy, or superhero-heavy, but that this doesn't mean there is no market, or that the theme can't thrive as a low key one. Maybe release 20 sets across 4 factions, and keep them in production for 5-10 years just for people interested in this stuff. Perhaps focus on industrial stuff like giant space diggers, space trains, space police ships; after all, Lego Space was in some ways Lego City plus 3000 years. Introducing a restricted humans vs aliens theme was arguably what hollowed out those later 2010s themes, with their generic space men shooting generic bugs. Building a lived-in setting is what I would rather see, and that has always been what attracted people to space settings. It might even help distinguish the product from Ninjago, if the TV show was actually more adult and sober, like a classic space opera show, such as Babylon 5 or Star Trek. It might even find accidental success. At the three fan conventions I've been to, there has been large displays dedicated to Classic Space and the subthemes. The last one I went to had two tables: one for Classic Space and one for Space Police I! When I trawl through the Flickr LEGO group photos there are Classic Space MOCs posted nearly every day! Fans have an outlet to let TLG know what we want: LEGO Ideas. They even gave us the Exosuit (with turtle). I bought three. The question I have is why don't Classic Space submissions hit 10,000 votes more often? The good ones seem to time out at around 6-7,000 votes. I vote for every single one I see, regardless of quality! But ultimately, my single vote for an Ideas project and my limited wallet don't constitute a large enough political voting bloc to make any significant difference to TLG's finances. The bottomline is that if we want to see LEGO Space return, we need to provide evidence to TLG that the market is there. And I'm thinking that doesn't exist and that in order for LEGO Space to return, it will have to incorporate lessons from Ninjago. Except that Galaxy Squad did that and failed. So I've hit a mental wall. I had not thought of Nexo in this way; that's very interesting. As for what makes Ninjago tick, I think it's a combination of ninjas & dragons (both of which kids like), creative villain factions, a competently-made tv series, and that the theme lately has been able to reinvent itself each wave able still staying Ninjago. I agree that the non-specific setting of Ninjago allows it a lot of flexibility as a theme that other themes aren't really afforded--it can do anything and not really steal from any other theme. Space, on the other hand, the classic adventurous, pseudo-realistic Sci-Fi we know and love, inhabits a very narrow gap between Star Wars and NASA/Ideas, and some apparent competition in the TLM2 sets, and to some extent, Ninjago. Could a serious push be made by TLG to fill this gap and create a new, freestanding Space theme? Definitely. Will they? I think so. But we will have to wait, at least until TLM2 has run its course, and then it matters how Ninjago is still fairing, and Star Wars, and whatever else TLG has in the wings. would you like to see new audiences be able to get into﻿ a new Lego Space theme that had a shared universe, like we had back when these sets were released? If it were new, yes. If it were the old themes rehashed, *eh*. I would rather see a new new theme than a retread. It can include easter eggs, sure, but as much as I love Ice Planet 2002, I have no real desire to see Ice Planet 2102 (for example). Well, while I'm not happy with the idea of making Lego Space more character-focused, one lesson I think could easily be incorporated from what I assume Ninjago does (I'm guessing it has a Skeletor-like overlord villain), is to include a powerful evil leader figure, who has a cool minifig design, who mainly just sits back on a throne issuing orders (I love those kind of villains). Perhaps Blacktron are led by an evil Scorpius / Sauron / Skeletor / The Emperor / Dr Robotnik / Ganondorf type figure, called the "Supreme Blacktron" or something dramatic like that, who plans and directs the Blacktron civilization, but is trapped in a stasis-pod so had to send his Blacktron Troopers to steal minerals and ice from M-Tron and Ice Planet cultures. Also maybe never show characters without a space suit. That can be really interesting as a style, as if they just constantly live in suits. Things are only awesome if handled right; it's all down to whether or not it's stories/ideas are actually any good, speaking to people on some deep level that they find compelling, the way Star Trek often had ethical ideas concealed within it's stories. I've spent ages online debating with people why some sci-fi was so much more compelling than another one, and a lot of it comes down to the interesting world building. Some settings just seem hollow, or feel artificial, others like Star Trek, Star Wars, Stargate SG1, Farscape, Babylon 5, Firefly, etc, feel natural, with compelling cultures. They just feel like they naturally grew, but are full of exotic concepts. The spartan no-explanation-given asteroid dioramas from the old Lego catalogue gave that same feeling, like people had been living this way for as long as they could remember, and I worry an attempt at modernising Lego Space would miss that. Science fiction almost by nature needs to be slightly educational, since the concepts are not widely understood. As for other characters, maybe the hero could be a young ice miner out of his depth, or a Space Police guy. There is a related thread discussing the popularity of Galaxy Squad and why it worked/didn't work. Some good points are made there. I agree that a strong antagonist(s) is necessary to give gravitas to the struggle of the heroes. The journey of the heroes is only meaningful if they have to undergo a transformation to overcome the challenges they face. 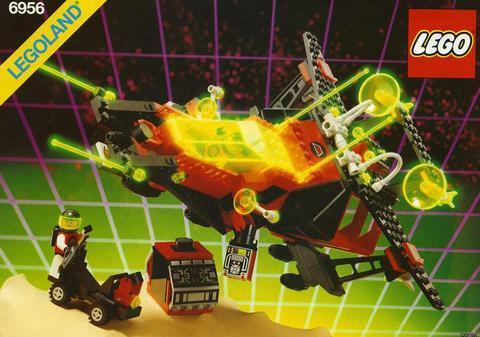 What's handy about LEGO Space is that like Ninjago, it already has different bad guy factions: Blacktron and Spyrius. Which combines nicely with a children's TV show, since lessons about respect, honesty, perseverance, and friendship are already at the core of each episode. Science fiction, at its most fundamental, are stories about the intersection between technology and the human condition. Some of these can get pretty heady and deeply philosophical, but I think it's possible to keep the topics accessible to children, while still making it educational and enjoyable for parents. I'll say it before and I'll say it again. They'd only need one set a year to make old fans happy and they could change the theme for each set (Blacktron, Ice Planet, etc). The sets would ideally have no stickers, classic style minifigs, and a couple of printed bricks -- like existing Creator sets. And they'd have the usual alternate builds, reusable parts, and interesting build techniques. I'd hope each set would have a ship, rover/mech, and base build, with a few different wind screens. And it doesn't clog up a whole shelf-worth of retail space or too much factory time etc. Similar has been said about Castle. I am all for it. Injecting Space and Castle into Creator is clearly the strategy with the lowest risk for the company, but I still wonder if it's viable, given that Creator increasingly feels like a subtheme of City. I assume you refer to modern Creator sets, with sophisticated primary builds that don't look like table scraps? Those would probably still require some significant conceptual effort to decide what they're going to be, and then significant design effort to develop the three models, if you're going to do something more creative than an iconic real-world space shuttle or a generic robot/mech. There have already been brick boxes with Castle and Space parts this year (Building Bigger Thinking), but I haven't the imagination to get those for their Space content. Although I find the shared universe of classic Space subthemes (by which I mean the pre-1999 Space line as a whole, rather than the 1978-1987 waves labeled "Classic" on Brickset) charming, I don't feel like the set designs were generally any better back then than more recent Space set designs since the early 2000s bankruptcy crisis. In general, the sets between, say, 1988 and 1998 relied far more heavily on large, complex parts that took more imagination to recontextualize than today's parts. Today's "specialized" parts are generally small elements of geometry for a builder's toolkit; the "specialized" parts of the classic Space era were generally platforms that represented entire spacecraft features or that encapsulated large complex geometries in a single part. However, I do agree that older sets were easier for children to build and rebuild into alternate models, because the larger parts meant that less thought and planning were required to decide what to build and how to build it. 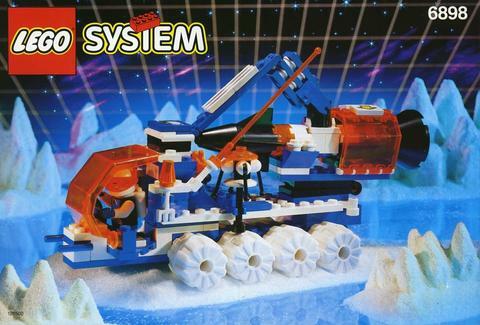 Although I admire some of the classic Space subthemes (particularly the 1978-1983 waves of Classic Space), I don't actually want Lego to revisit them as new Space subthemes, at least not openly. It would require just as much creative effort, market research, and product testing to develop a rebooted "Blacktron" or "Ice Planet" Space theme as to develop any other new Space theme, and an entirely new theme would allow set designers more creative freedom and risk less flak from disappointed AFOLs who complain that their childhood was ruined when the new sets don't resemble their favorite neo-Blacktron or neo-Ice Planet MOCs. For example, look to the 2009 and 2015 incarnations of Pirates: as sets, they were perfectly competent reboots of a well-loved classic theme, and they were very faithful to the tone and content of the classic theme too. But they flopped at least partially because the market wasn't right with children and at least partially because AFOLs didn't think they were creative enough. I except another Space Police line from my preference that Lego avoid direct conceptual retreads of classic Space subthemes, because "Space" + "Police" is a much more generic idea than "red space miners with magnets" or "black and yellow space spies that attack white and blue space explorers" or "blue, orange, and white spacemen that launch rockets from an ice planet." Rejecting Space Police 3, Alien Conquest, and Galaxy Squad because they feature cheesy B-movie aliens is fine from a perspective of personal taste, but it's a rather narrow view of the sci-fi/space opera genre to suggest that Space is necessarily better without them. I would also like a peaceful, humans-only, exploration-oriented Space subtheme that makes some nods toward "realism" and some nods toward the 1978-1983 classic, but (as I have said in other threads) most of what I would really want out of such a subtheme is covered pretty well, in a set here and a set there, in other themes right now. It helps that I am an adult with a job and I can go to Bricklink and eBay for classic sets that fill in the gaps. I recognize that if I were a kid without an income and with no knowledge of sets that were released before I was introduced to Lego, I would not be satisfied in this regard, but I also remember that as a kid in that position, Star Wars satisfied all my spaceship wants pretty well. To be successful year after year after year, a new Space theme would have to reinvent itself like Ninjago while avoiding conflict with Star Wars, Super Heroes, and City. Perhaps one of the reasons that Nexo Knights and Chima were relatively unsuccessful compared to Ninjago (a point which has been extensively debated in other threads, and one which I will not comment on here) is that their various subthemes all felt very similar to each other both aesthetically and in content - the hero and villain vehicles and bases changed color slightly from wave to wave, and had slightly different features, but in general they all looked pretty much the same. In contrast, Ninjago has been able to be at different times a theme about sky pirates and floating islands, cyberpunk biker gangs, post-apoc dieselpunk raiders, giant mechs fighting kaijus in the city center, highly realistic quasi-medieval Japanese landscapes and ships and temples, and several other distinctly different ideas and looks, while retaining just enough stylistic unity to be recognizable as the same theme from wave to wave due to its common elements of color-coded ninja heroes, a certain distinctive design flair, and the common understanding that the stories occur on a cartoon planet Earth, or if not on Earth (I'm unfamiliar with the lore), clearly not "in space." It has been widely discussed, and agreed, in other threads that there's plenty of room for a new Space theme to keep reinventing itself like that while staying away from Star Wars, Super Heroes, and City, if it was treated as some sort of future city or as an umbrella theme that can cover a lot of different content, like City covers a lot of different ground in its exploration subthemes. Although conceptually there's plenty of room for an umbrella Space theme, I doubt that Lego has the capacity (especially in TV production) to provide such a theme the long-running support it would need to succeed, especially when internal resources are already heavily allocated towards so many other long-running, successful themes: Architecture, City, Creator, Creator Expert, Friends, Minecraft, Star Wars, Super Heroes, Technic; and other successful themes that have required heavy internal investment and have potential to run for several more years, like Harry Potter and Speed Champions. One reason that Space was able to take off as a successful line in the 1980s was that not only were there a lot of space opera TV shows and movies at the time, like Star Trek and Star Wars, but there were also a lot of shows with the boxy, greebly grey visual style besides the big franchises that were relatively accessible to children - UFO, Space:1999, Silent Running, etc. (And Alien, though that wasn't aimed at children.) There was also a sense of progress in crewed space exploration, at least among children, because the Space Shuttle was still new and shiny and it wouldn't have been apparent to children that the Space Station was still 20 years away and nobody would be going back to the Moon anytime soon. And - here's the kicker - Lego didn't have the license to any of those properties yet, so any kid wanting a Lego spaceship had to get something from the in-house Space line. Today Lego already has a license to most of the child-friendly space opera in the cinema (via Star Wars and Super Heroes), and it's not shy about producing NASA sets if it wants to, even if the many rejected NASA Ideas projects and the disappointing Moments in Space gift with purchase contest make it seem like that. Although there is a good amount of pretty good sci-fi on TV right now (like The Expanse and, depending on who you ask, Star Trek: Discovery), it's generally aimed at adult audiences and features levels of blood and guts and bad behavior that are comparable to Game of Thrones. The thoughtful, serious, relatively realistic, and relatively family-friendly films Ender's Game, Gravity, Interstellar, and The Martian had very little toy and collectible tie-in merchandise in general, so there wasn't anything in other segments of the toy industry that could drive film-related sales and thereby help support an in-house exploration-based Space subtheme launched at the same time, so in that time period I think Lego already did pretty well by releasing Galaxy Squad and the 2015 Space subtheme of City, plus the Benny spaceship and Super Secret Police Dropship from The Lego Movie. Besides, if anything of that nature came out now that had a big presence in other segments of the toy industry, Lego wouldn't push out an in-house theme featuring similar content. They'd just get the license too. All of the previous paragraph can be summarized like this: the Space theme had no competition in 1978, so it grew until it reached its natural limits and was replaced by Star Wars when the time was right. A sustained new in-house Space theme of the type that many AFOLs want would have too much competition now to be viable. There ain't no competition for ninjas and dragons, so Ninjago has kept on growing. Okay, that's enough of that. Instead of pounding out a few hundred words about Legos each night, why don't I pound out a few hundred words on my thesis? Because I don't understand the math, and misunderstood math can be a fierce adversary that wants no part with words!